You might want to turn off WPOven server caching for one of your sites, hosted on your WPOven server. To do this, firstly you need to ensure that the WPBase-Cache plugin is installed and activated on the site. Next you need to login to your site’s ‘wp-admin’ section and navigate to the ‘Settings’->’WPBase’ page. On this page you will see the WPBase-cache settings. 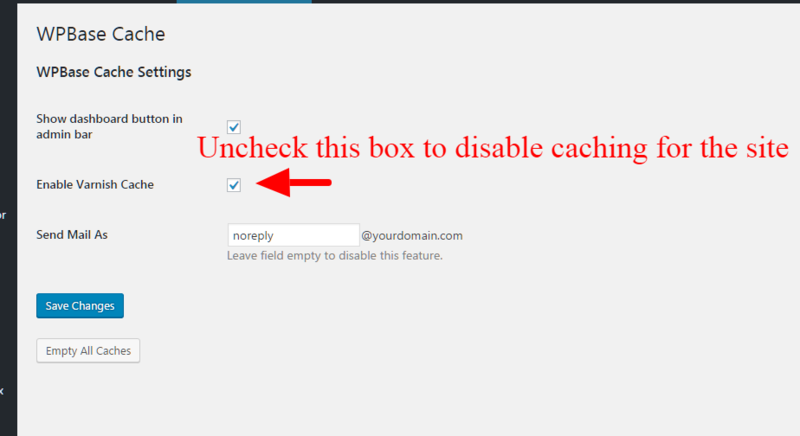 Here to disable caching for the site, you simply need to uncheck the ‘Enable Varnish Cache‘ checkbox and then press the ‘Save Changes‘ button.